A simple yet elegant and savory slow cooker beef stew that you can cook anytime. Cooking in a slow cooker tenderizes the meat and brings out the savory flavor unlike using a pressure cooker. It may take a long time using a slow cooker but the result is worth the waiting. Not only that, it will make your life easier cooking this recipe because all you have to do is combine everything in the pot and cook it for 8 to 9 hours in low heat. The result is a very tender and rich in flavor beef stew that no other method could do and can only be achieved by slow cooking. 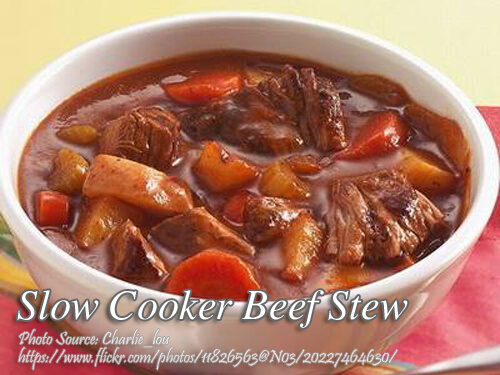 To cook slow cooker beef stew; Combine carrots, onions, potatoes, and beef in the slow cooker. Add in garlic, broth or stock, tomato paste, paprika, lemon zest, caraway seeds, pepper, bay leaf, and thyme. Stir ingredients in slow cooker to mix. Cover and cook on low heat for 8 to 9 hours. (Optional: set cooker to high heat and cook for 4 hours to save time). Once all ingredients are tender, add in pepper strips and continue cooking for thirty minutes. Combine carrots, onions, potatoes, and beef in the slow cooker. Add in garlic, broth or stock, tomato paste, paprika, lemon zest, caraway seeds, pepper, bay leaf, and thyme. Stir ingredients in slow cooker to mix. Cover and cook on low heat for 8 to 9 hours. Once all ingredients are tender, add in pepper strips and continue cooking for thirty minutes.